She's crafty: a Blog award! 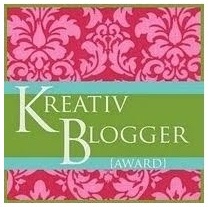 I am so excited...I received a blog award!! Woo hoo! It's from Angie at Thrifty like me. I'm a new follower of her blog and love that she is a Goodwill'er too! Thank the person who gave you the award & link back to their site in your original post. Pass along the award to 5 newly discovered bloggers. 1. I love candy and Diet Mountain Dew! Not together though. 2. I love having a clean and organized house. When I am grumpy or frustrated about something, grabbing the broom or dust cloth and getting to work calms me down. 3. I love antique/vintage items with a shabby and loved look. 4. Taking pictures makes me happy! 5. I am a quick decision maker. Sometimes I have regretted not researching something to death. Other times I'm just glad to be done. 6. I am terrible with confrontation and will do anything to avoid it. I get panic attacks if I have to confront someone with an issue. I used to not even make returns at Target just to avoid the situation. Thankfully, I'm getting better at that. 7. I love love love decorating my house. I'm am sorry to not do this part. I read sooo soo so many great blogs I can't choose just 5. If you are reading this and have a blog, consider yourself tagged.